Running a small business brings about many challenges. We at Go2marK love challenges and are ready to help your small business grow. Our Small Business SEO service is catered towards your needs. Small Business SEO will put your website in front of your existing and potential customers in the best way possible. 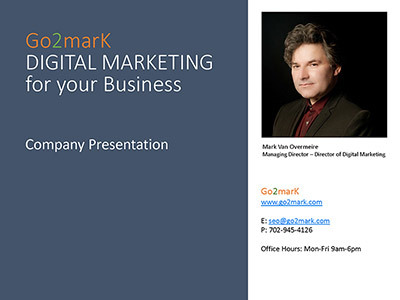 You will get professional SEO services from Go2marK that deliver results and stay within your marketing budget. What are the benefits of small business SEO? What are the steps involved in small business SEO? If your small business doesn't have a website we can design and host a complete small business SEO friendly website for you that looks fantastic on all devices. Go2marK will also suggest changing systems if the current one is not on par with the industry standard. WordPress and Drupal are just some of the open source content management systems (CMS) we work with for small business SEO. For a webshop, we love working with Magento and PrestaShop. Go2marK uses White Hat SEO only. This means ethical search engine optimization. Our professional small business SEO services respect the submission guidelines from the search engines at all times.